My interest in child care is a reflection of my childhood experience in day nurseries and my adult experience as a working single parent. During the Great Depression, my mother supported my sister and I by working in factories during the day. Then she would bring home additional piecework. I remember sitting around the kitchen table at night, pasting rhinestones into costume jewelry that would later be sold at Woolworth's. For my mother, work was an economic necessity, not a career choice. Fortunately, she was able to work because someone had the wisdom to set up a "day nursery" (1). My sister and I were among the first toddlers admitted. As though history were repeating itself, at the age of 22, I found myself alone with an infant son. At the time, I was a junior at Columbia University, supporting myself by driving a cab and collecting veteran's benefits (2) . I quickly discovered how hard it was to be a working single parent. Although the city operated a number of child care centers, they would not accept children of a single father unless he could prove that every female relative had refused to provide child care. Had I been a single mother, no one would have insisted that my sister or mother care for my son. For a while, I tried a number of solutions. All eventually proved untenable. I learned how cruel strangers could be to boarders-even small children. For a while, I hired a nursemaid and then shared one with another single parent. Eventually I was forced to let my son live with a loving aunt and a resentful uncle. That too proved untenable. By that time I was working in Philadelphia and, thanks to a dear friend and his family, I could cope with being a single father. I relate this experience so you will understand why I have a special appreciation for the working parent. The Institute for Scientific Information (ISI) Caring Center for Children and Parents, which opened four years ago, is designed to care for the children of our employees. But it is also there to serve the children of parents who work and live in Philadelphia. More than one hundred twenty-five children, aged six weeks to six years, attend the center on a full- or part-time basis. I'll describe the center in more detail shortly. But because child care has become such an important social issue, it merits separate treatment. So I'll first concentrate on corporate child care programs. The types of care available in the United States fall into three broad categories. About half the children of working mothers are cared for by paid sitters in either the child's or the sitter's home. Many such sitters operate what are called family day-care homes, looking after their own children in addition to a few neighborhood youngsters. Another third of the children are cared for by relatives, usually at no financial cost to the parent. This type of care most closely resembles the care traditionally provided by extended families. However, the increased mobility of the U.S. labor force means many parents live long distances from relatives and don't have this alternative. Finally, about 16% of the children attend childcare centers, where larger groups of children participate in planned programs directed by a trained staff (3) . Day-care centers are generally operated by governments, corporations, hospitals, the military, religious groups, and commercial ventures involved in only the day-care business (4) . Several types of organizations that employ a large number of women, most notably the military, hospitals, and textile manufacturers, have been operating child care centers for many years. However, in 1984 only about 350 companies in the United States sponsored some form of support for the children of employees. Today about 2000 do so. About 50 companies operate their own centers, either on site or in the neighborhood of the company. Tuition in these centers is usually fully or partially subsidized by the company (5) . Many firms that do not operate their own centers hire child care professionals to investigate community programs and refer parents to those appropriate for their children. These companies often reserve space in local programs for children of their staff. In areas where adequate child-care is available, some companies pick up the cost of child care arrangements made by parents. Many companies that provide day-care benefits have instituted a system of flexible schedules that permit parents to arrange work hours around their children's schedules (6) . Although few companies offer such benefits, child care promises to be one of the most important issues facing employers in the 1980s. According to 1980 U.S. Census Bureau statistics, nearly half the women in the United States with children under six years old are employed, compared with less than one-third only a decade ago (7 , 8). Great Britain reports similar figures, and in Sweden, two-thirds of the mothers with children under three years old work outside the home (9) . Although many of these women are working for personal fulfillment, the current economic situation has made two paychecks a necessity for many families. Divorces have increased sevenfold in the United States since the turn of the century, and this forces single parents into the work force (9) . In many countries, the government recognizes the widespread need for day care and sponsors centers for the children of working parents. In France, mothers can send infants and toddlers to crèches , and three- to six-year-olds to écoles maternelles , both of which offer full-day programs. Since 1956, the Soviet Union has made yasli-sads available to children six weeks old and older. In factories in the People's Republic of China, aunties care for small groups of children under three years old. By 1980, 67 countries�but not the United States�also provided cash benefits designed to help parents stay home with young children. Sweden leads in this area, offering paid maternity and paternity leave for up to nine months (10) . Unfortunately, the United States ranks well below other developed nations in its support for working parents. The U.S. government has failed to enact any legislation to provide comprehensive child care. And many of the day-care programs that had been serving the poor have been eliminated (11) . Many corporations in the United States are tilling the child-care gap created by government inaction. Quite a few are also reporting tangible benefits from doing so. In one survey of about 300 organizations sponsoring child care, more than half of the employers polled claimed that providing day care enhanced their ability to recruit employees (4) . Nearly half also reported lower absenteeism by working parents and general improvement in employee morale. Slightly more than one-third said that employee turnover had declined since the establishment of child care centers (1) . Tangible benefits of employer-sponsored day care have been reported by Intermedics, Inc. This Texas-based medical technology firm recorded a 23% drop in employee turnover and 15,000 fewer work hours lost to absenteeism during its center's first year of operation. PCA International, Inc., a photo-processing company in North Carolina, claims its center saved about $50,000 a year in recruitment and turnover costs (12) . For parents, high-quality day care near work means more time spent with children during the commute to and from work and during lunch. Mothers with infants can nurse during the day, and all parents benefit from the peace of mind that comes with knowing their children are in a caring and stimulating environment. Because corporations usually subsidize their day-care centers, employees usually pay lower fees than they would be charged for comparable care elsewhere (4) . Although researchers continue to debate the merits of substitute care, certain guidelines for day-care centers are widely accepted. Because children in mixed age groups tend to be more socially competent, experts recommend that youngsters within a few years of one another be grouped together. Alison Clarke-Stewart bases this recommendation on studies showing that children in mixed age groups, especially younger children, "have more frequent and complex interactions with their peers and are more cooperative, persistent, flexible, and knowledgeable in tests of social competence and intelligence" (9) . Most experts also agree that classes should be kept small and the child-adult ratio low. Clarke-Stewart explains that levels of noise and activity in larger classrooms can be too physically and psychologically demanding for teacher and child. Even more important than the age mix, Clarke-Stewart writes, is the warmth of the caregiver and his or her involvement with the child. A good caregiver is one who is actively involved in talking, teaching, and playing with the child, but who still permits freedom, initiative, and exploration. The caregiver should guide the child through positive encouragement and suggestions, rather than demands or punishment. He or she should also be trained in child development or child care and have five to ten years of experience (9) . Most day-care research has thus far been done in high-quality centers that may not be representative of the type of care most children receive. And the widespread use of day care is a relatively new phenomenon, so the long-term effects on children are still unknown. What is unmistakably evident is the need for more, and better, day-care centers in the United States. In a 1977 survey of some 3000 mothers, only 19% who wanted to send their children to day-care centers could find openings (13) . This situation will worsen in the next decade, as parents in the United States seek care for an anticipated 10.4 million children (14) . Kathleen Norris, in her book Hands Full of Living , wrote: "We can't give our children the future, strive though we may to make it secure. But we can give them the present" (15) . Companies that are concerned about the present generation of children and the welfare and productivity of their working parents will have to provide quality care for these youngsters. The ISI Caring Center can accommodate 156 children, aged six weeks to six years. In addition to the children of ISI employees, we enroll the children of people who live or work anywhere in the greater Philadelphia area. Located behind ISI headquarters, the 14,000-ft 2 building was custom built for young children. All furniture and fixtures are scaled for comfortable use by small bodies, and carefully selected lighting and colors avoid an institutional look. The center also features art that focuses on child-related themes and a playground with enough space for a variety of outdoor activities. Most important, we've hired a highly qualified staff trained in early childhood development and education. Peter Aborn, a former senior vice-president, was responsible for planning the center (16) . He negotiated with Philadelphia authorities for the acquisition of the 1.6-acre site on which it is built. He was also responsible for local community relations. Harmony with our neighbors is vital to the success of such an enterprise. He also spent nearly three years reviewing the child care literature, visiting centers throughout the country, and consulting experts in the field. The center is an attractive, spacious structure with anopen floor plan. Each classroom is defined by 7-ft wood-framed partitions that are plain framed blackboards or that form storage units for children's belongings. These partitions give the center some flexibility because they can be moved to accommodate changes in enrollment and in the program. Each room also includes permanent partitions with sinks in them. In the infant area partitions include diapering facilities with soft counters and special sinks for flushing waste. Older children's rooms include private areas with child-sized toilets. The only other enclosed areas in the building are the staff offices and a fully outfitted commercial kitchen. The building is organized into discrete areas for each group of youngsters. Infants are housed in small rooms toward the rear, away from the more boisterous older children. Toward the front of the building are larger rooms for toddlers, pre-kindergarten children, and kindergarteners. These rooms open out into play areas with floor-to-ceiling windows facing onto the playground. Because children can spend as much as 11 hours a day at the center, we've tried to create an environment that is attractive and serene yet stimulating for children. Floor-to-ceiling windows at the front of the building fill the center with natural light, and skylights toward the rear of the building provide filtered light. Artificial lighting for the center was designed by Philadelphia artist Remo Saraceni, whose playful attitude toward technology is reflected in the cylindrical and cloud-shaped lighting in the center. By directing fluorescent light through colored gels, Saraceni has created a spectrum of color in many fixtures (17) . The center has a subtle sense of the outdoors created by painting walls and columns in muted pastels to mimic natural colors and shapes. The 17-ft.-high ceilings are painted sky blue, and the lower walls are painted to look like a rolling, earth-tone hill. Columns are brown at the base and green at the top, like trees. With 10,000 ft.2 of space, the playground is large enough to include paved areas on which children can ride tricycles and bicycles, grassy areas with play equipment, and large trees. Infants spend much of their time in a small, somewhat secluded area bounded by three of the building's walls and a white picket fence. We've made every effort to ensure the safety of children at the center. Electronically controlled doors safeguard the main and emergency entrances, and the playground is fully enclosed by walls and fences. Our fire alarm system is directly linked to Philadelphia's central fire station, and each of the children's rooms is within a few feet of an exterior door. We also have incorporated nonskid surfaces and avoided sharp edges wherever possible. The heat pump that heats, cools, and ventilates the building includes a filtration system that screens out many airborne pollutants that affect allergic youngsters. Because art can play an important role in stimulating children to use their imaginations and express their emotions (18), several artists were commissioned to create original works for us. Covering the entire west wall of the building is a carved concrete and mosaic mural entitled "A Celebration of Working Parents and Their Children." It depicts children, adults, trees, animals, and Philadelphia scenes. Four large ceramic tile murals face the child-care center (19 , 20) . A Huichol yarn painting (21 , 22) executed by an artist from Mexico is on display inside the center. In addition to the murals, we commissioned a bronze sculpture of a puma, which "lives" in the children's playground. It is life-sized as well as lifelike. The most important components of our day-care center are the program and the people who interact with the children. Susan Silverstein, executive director of the ISI Caring Center, has a master's degree in human development and family studies and 13 years of teaching and administrative experience in early childhood programs. Marlene Weinstein, a child-care consultant and author, was involved in planning the center from the outset (18) . Our approach to child care is developmental�that is, it is based on the theory that children go through several stages of emotional, social, physical, and cognitive development (23-26) . Our staff is trained to recognize these stages and present children with the tasks that will support their passage through them. Silverstein likens the child care program to a theatrical production in which the staff members are "directors who provide the setting and props for the children and help them act out the phases of their development. When they are ready for more sophisticated concepts, tools, and activities, we alter the stage and props." Because children easily become boisterous and tired, each program follows a schedule that alternates quiet times with active times, indoor play with outdoor play, and activities led by the teacher with those in which the children play on their own. All of the youngsters nap or play quietly after lunch, from about 12:30 p.m. to 3 p.m. Pre-kindergarten and kindergarten children who are not taken home after their naps join the center's after-school program, called "Rocket to Adventure." This program focuses on an appreciation of the arts. Following an outdoor activity and an afternoon snack, small groups of children participate in hour-long activities that feature music and rhythm, dance and movement, arts and crafts, science, or dramatics. The ISI Caring Center staff believes that parents should be involved in the program. Several "parents' nights" are held each year. Equally important, staff members periodically have conferences with each child's parents. The staff also keeps daily logs of what the children do during the day: how well they eat and sleep, if they've learned any new words or movements, and other information indicative of the child's growth and well-being. Parents are encouraged to consult these logs and to let the staff know of any changes in the child's home life, such as new experiences or changes in routines. Parents are also welcome to visit their children at the center at times arranged with the staff. The center provides training for student teachers from a number of early education programs at local colleges and universities. These students improve the teacher-child ratio, which results in more individualized care. The center also has access to pediatricians and nurses from Presbyterian Medical Center, a few blocks from ISI, who are consulted when a child becomes ill or has an accident. Those involved in the ISI Caring Center are proud of the center and of the quality of its care. But it is only one component of our family-oriented employee benefits package. We also have a child-care assistance plan that defrays some child-care costs. This plan includes a direct subsidy that defrays up to 60% of the cost, depending on the family's income and the number of children in day care. The subsidy is not taxable and can be applied only to the ISI Caring Center. Parents can also convert half of their personal and sick leave (one week a year) and all of their annual leave (two to four weeks a year) into nontaxable credit that can be used to pay for care at any day-care center. Finally, ISI's child care assistance plan helps parents take advantage of the U.S. government's child care tax credit, which can amount to a direct tax reduction of as much as $2400 for one child. Rather than waiting until the end of the tax year to take advantage of the credit, parents simply arrange to have less tax withheld from their paychecks. This provides extra cash immediately for paying child care expenses. Other family-oriented benefits include our flextime schedule, which permits parents to work hours that fit into their family's schedule. Parents also can use their personal and sick leave to care for sick children or to watch them in a school play. And our medical, dental, prescription, and mental health plans are available to all family members at no extra cost to our employees. Many companies that offer child care programs have reported such tangible benefits as lower turnover and absenteeism and an easier time recruiting employees (4). Because all computer-based industries are highly competitive, we eventually expect to see some of these payoffs too. In any event, we have the satisfaction of making a contribution to future generations. And our employees, parents and non-parents alike, can't help but profit from the enthusiasm and joy of these young children. My thanks to Joan Lipinsky Cochran for her help in the preparation of this essay. Adapted with permission from Current Contents. Copyright 1983, Institute for Scientific Information. back Garfield, E. In Essays of an Information Scientist; ISI Press: Philadelphia, 1977; Vol. 2, pp. 535-36.
back U.S. Department of Labor, Women's Bureau. Child Care Centers Sponsored by Employers and Labor Unions in the United States; U.S. Department of Labor, Women's Bureau: Washington, D.C., 1980 (report). back Garfield, E. In Essays of an Information Scientist; ISI Press: Philadelphia, 1980; Vol. 3, pp. 116-18.
back Carro, G. Ladies Home J. 1982, 99, 69-70, 103-4.
back Ardman, C. J. Commerce 1982, Aug. 9, 7A. back McCroskey, J. Pers. J. 1982, 61, 30-38.
back Kleiman, C. Philadelphia Inquirer 1982, Sept. 23, 3E. back Garfield, E. Current Contents 1986, 24, 3-11.
back Clarke-Stewart, A. Daycare; Harvard University Press: Cambridge, Mass., 1982.
back Kamerman, S. B. Mon. Lab. Rev. 1980, 103(11), 23-28.
back Bus. Week 1981, 2719, 60, 63.
back Porter, S. Philadelphia Inquirer 1982, July 25, 4L. back U.S. Department of Labor, Women's Bureau. Community Solutions for Child-Care. U.S. Department of Labor, Women's Bureau: Washington, D.C., August 1979 (report). back Verzaro-Lawrence, M.; LaBlanc, D.; Hennon, C. Young Child 1982, 37(2), 4-10.
back Murphy, E. F. The Crown Treasury of Relevant Quotations; Crown: New York, 1978; p. 140.
back Garfield, E. Essays of an Information Scientist; ISI Press: Philadelphia, 1981; Vol. 4, pp. 351-54.
back Levy, M. Z. New York 1976, 9(16), 73.
back Evans, E. B.; Shub, B.; Weinstein, M. Day Care: How to Plan, Develop, and Operate a Day Care Center; Beacon Press: Boston, 1971.
back Garfield, E. In Essays of an Information Scientist; ISI Press: Philadelphia, 1983; Vol. 5, pp. 15-19.
back Garfield, E. Current Contents 1986, 33 (in press). back Garfield, E. In Essays of an Information Scientist; ISI Press: Philadelphia, 1983; Vol. 5, pp. 164-70.
back Garfield, E. Current Contents 1986, 22, 3-8.
back Piaget,J. The Psychology of Intelligence; Routledge & Kegan, Paul: New York, 1950.
back Erikson, E. H. Childhood and Society; Norton: New York, 1963; pp. 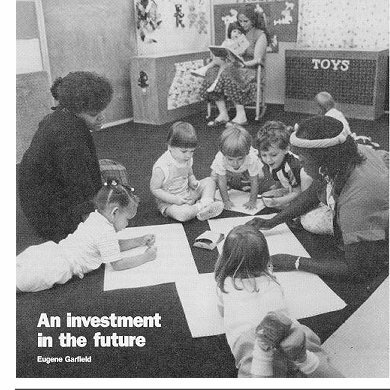 247-74.
back Glover, M. E.; Preminger, J. L.; Sanford, A. R. Early LAP: The Early Learning Accomplishment Profile for Developmentally Young Children; Kaplan Press: Winston-Salem, N.C., 1978.
back Evaluating Children's Progress; Southeastern Day-Care Project: Atlanta, 1973. 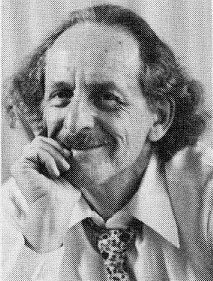 Eugene Garfield is the founder and president of the Institute for Scientific Information, Inc. (3501 Market St., Philadelphia, Pa. 19104; 215-386-0100). His education includes a B.S. in chemistry and an M.S. in library science from Columbia University; he also holds a Ph.D. in structural linguistics from the University of Pennsylvania. He has received numerous awards, including the 1977 Herman Skolnik Award and the 1984 Derek de Solla Price Memorial Medal in scientometrics.